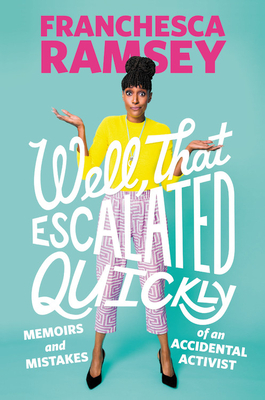 In this sharp, funny, and timely collection of personal essays, veteran video blogger and star of MTV's Decoded Franchesca Ramsey explores race, identity, online activism, and the downfall of real communication in the age of social media rants, trolls, and call-out wars. Franchesca Ramsey didn't set out to be an activist. Or a comedian. Or a commentator on identity, race, and culture, really. But then her YouTube video "What White Girls Say . . . to Black Girls" went viral. Twelve million views viral. Faced with an avalanche of media requests, fan letters, and hate mail, she had two choices: Jump in and make her voice heard or step back and let others frame the conversation. After a crash course in social justice and more than a few foot-in-mouth moments, she realized she had a unique talent and passion for breaking down injustice in America in ways that could make people listen and engage. In her first book, Ramsey uses her own experiences as an accidental activist to explore the many ways we communicate with each other--from the highs of bridging gaps and making connections to the many pitfalls that accompany talking about race, power, sexuality, and gender in an unpredictable public space...the internet. WELL, THAT ESCALATED QUICKLY includes Ramsey's advice on dealing with internet trolls and low-key racists, confessions about being a former online hater herself, and her personal hits and misses in activist debates with everyone from bigoted Facebook friends and misguided relatives to mainstream celebrities and YouTube influencers. With sharp humor and her trademark candor, Ramsey shows readers we can have tough conversations that move the dialogue forward, rather than backward, if we just approach them in the right way. Franchesca Ramsey is a social justice advocate, comedian, actress, writer, video blogger, sought-after speaker, and the host of the award-winning web series Decoded on MTV. With videos topping 12 million views, she has been featured on NPR, Anderson Cooper, CNN, MTV, the BBC, and in the New York Times. A former writer and correspondent for The Nightly Show with Larry Wilmore, she now has a major late-night television show in development with Comedy Central. She lives in New York City and this is her first book.